Greetings from the Sillars household. Feel free to browse, drop an e-mail (below) or send telepathic thoughts. We look forward to hearing from you. 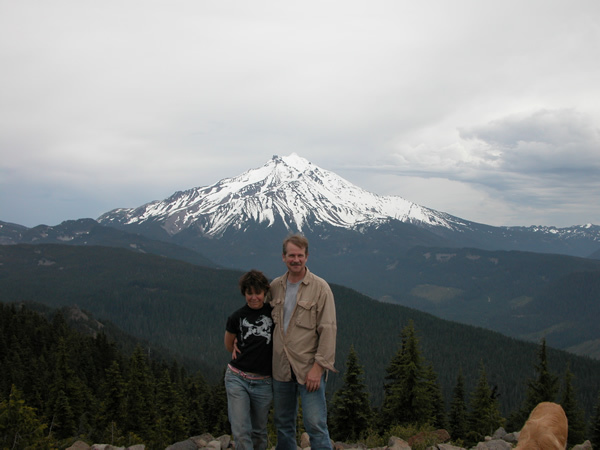 That's us--Carol & David--standing on Triangulation Point in the Oregon Cascades, with Mt. Jefferson in the background. We've spent much of our time exploring the Cascades, the Willamette Valley and the Oregon coast. The kids? Jaclyn (Rushing) is a junior at Corvallis High School, Kailyn's the Pet Care Manager at Petsmart in Kennesaw, GA. Her sister, Crystal is a Bid Specialist at Computrac, an RM Education, PLC company in Ballground, Georgia. <<Check out the studio link on your left to see what creative arts are coming out of the family these days. If you have a Sillars.com email address, click here to access your email.